Daniel Henry calls for unity in the syndication war by proposing a new format called SDF. I haven't had a chance to really read the spec, but Daniel has obviously put a lot of effort into it. Although I'm certainly not wild about yet another feed format, if SDF ever gets widely used I'll support in FeedDemon. Dave Shea on the JPEG patent dispute. Just finished a newspaper style named "Gray Boxes" which I plan to include in the upcoming FeedDemon 1.10. Unlike most styles, this one sorts news items by title. IMO, this makes "Group Newspapers" more readable since items aren't grouped by channel. To download and apply this new style, simply view this page in FeedDemon and click this link. "Mappings" are one of TopStyle's most powerful features, but they're apparently also one of the most confusing. So what are mappings all about? In a nutshell, mappings enable TopStyle to preview files containing server-side code (PHP, ASP, etc.). Server-side code must be processed by a web server such as IIS or Apache, so TopStyle uses a mapping to pass the current file through your local web server in order to preview it. Perhaps the biggest stumbling block with mappings is the fact that they only work with a local web server (ie: http://localhost/). Since TopStyle's preview displays the file you're currently editing, mapping to an external web server won't work. Once this is configured, whenever you edit a file in c:\InetPub\wwwroot\, TopStyle will preview it using http://localhost/. Put simply, TopStyle replaces "c:\InetPub\wwwroot\" with "http://localhost/" in order to preview your file. If you're using TopStyle and are having a tough time with mappings, please take a few minutes to read the "Understanding Mappings" section in TopStyle's help file. I don't normally publicize this fact, but a decent chunk of what I earn goes to charity. For example, in addition to several smaller donations, last year Bradbury Software donated $5000.00 to a local women's shelter, and earlier in the year I gave $1000.00 to a local children's hospitable. The biggest problem for me isn't giving the money, but instead figuring out which charities are worthwhile. All too often I've donated to charities which sounded good but in fact did little to actually help people other than themselves. Or I've given to charities which were worthwhile, but circumstances beyond their control prevented their help from reaching those who needed it. Finding out which charities are worthwhile can take a lot of time, so it's a blessing to discover a friend who has already done the work. Every year my good friend Kevin Carter hosts a "Waiting for Wishes" fundraiser dinner which raises money for charities he's researched, and I'm always glad to be invited. I have to confess, though, that part of the reason I enjoy the dinner is because it lets loose the prankster in me. You see, Kevin plays for the Tennesse Titans, and he invites fellow teammates to be waiters. In order to raise money, those attending the dinner are supposed to pay these NFL players to sign autographs, sing songs, etc. Well, I figure I should get my money's worth, so I gave $1000.00 to see Kevin play the part of Rhett Butler in Gone With the Wind. And of course Kevin had to choose another teammate to be his Scarlett O'Hara. "He did not think of this course of action as suicidal, but as another gallant gamble of the sort he was accustomed to winning." Just thought I'd show off a picture of my office setup to anyone who's curious. I work from home in a room set off by itself, which isolates the rest of the house from the ungodly noise eminating from my Logitech Z-680 speakers (now playing: Zappa's "Roxy and Elsewhere," alternating with Outkast's latest). 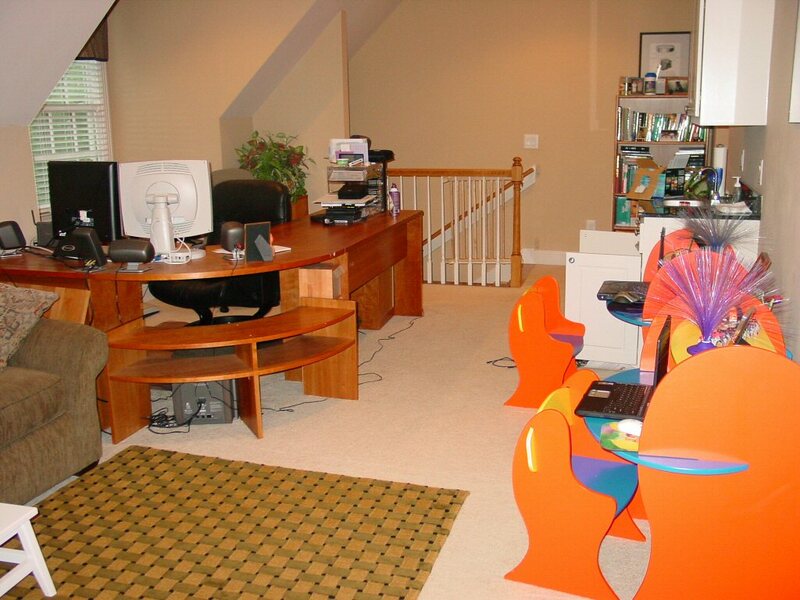 Oh, and the two little orange-red desks at the right belong to my son and my daughter. When I'm not travelling, they claim ownership of my laptops. My son (age four) is a whiz at Sonic the Hedgehog, while my daughter (age three) loves her Dora the Explorer games. And they both get a big kick out of Scholastic's "I-Spy" video games. I've had a number of questions lately concerning the future of TopStyle, which is understandable given that it's been a year since TopStyle was updated. The short answer: TopStyle will certainly be updated. Even though FeedDemon is getting more attention these days (since it's new), the truth is that TopStyle sells more copies. And besides, I use TopStyle every day to maintain my site - so even if sales dried up, I'd keep it updated for my own use! Each of these features had been requested many times by customers, so I wanted to add all of them to version 4.0. Unfortunately, every one of these features - especially Unicode support - required making huge changes to TopStyle's foundation. Adding them all at once to the existing code base was too much, and resulted in a ungodly mess of code that even I couldn't use, let alone hand over to paying customers. In short, my first attempt at TopStyle Pro 4.0 was a failure. So what now? Well, once I return to work I plan to continue development of FeedDemon 1.10 in parallel with TopStyle Pro 3.11, which will be a free upgrade from the current version. As the version number suggests, 3.11 will be primarily a bug-fix release. Once that's out the door, I'll start over with version 4.0, only this time with a more manageable set of improvements. I planned to watch a ton of DVDs while recovering from surgery, but instead I've been blasting away at anything that moves in Unreal Tournament 2004 (UT2004). I have a recliner set up in front of my computer which keeps my neck supported - not exactly a great position for real computer work, but good enough for fragging. I used to be addicated to games, but after the birth of my son four years ago I decided time was too precious to waste on video games, so I gave them up. Now that I'm (temporarily!) hooked on games again, I'm stunned at how far they've progressed. UT2004 is light years ahead of the games I used to play. If other software progressed as fast as video games, Windows Longhorn would already be outdated.